contours, shapes and slims your body without surgery. Boost your self-confidence! VelaShape 3 is an FDA cleared device that effectively and safely contours, shapes and slims the body by reducing cellulite and firming problem areas in as little as 4 treatments. The treatment provides patients with the fastest clinically-proven, non-surgical solution for slimming, circumferential reduction, and improvement in the appearance of cellulite. Worry no more about those dreaded love handles, or unwanted cellulite spots on your arms, stomach, thighs, or buttocks anymore. VelaShape 3 is safe, painless approach to target area-specific problems and can be used to effectively address a number of common problem areas for both men and women alike. 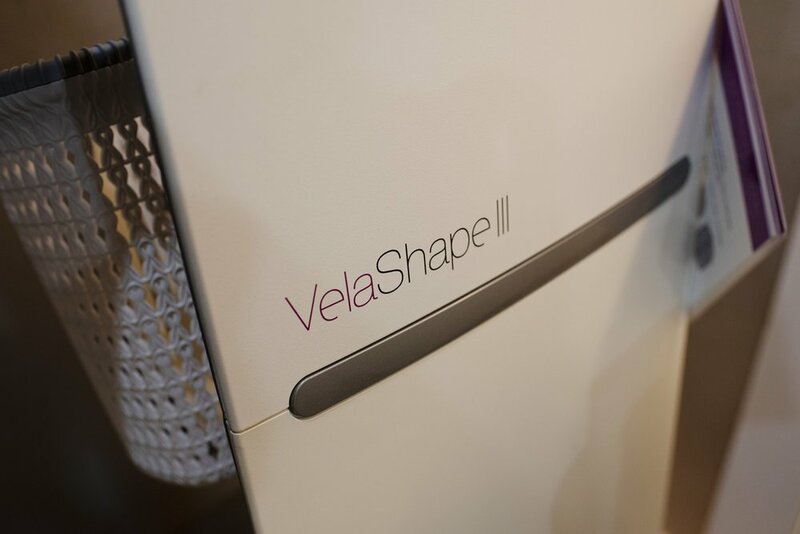 VelaShape 3 is a non-invasive medical device based on the the latest update of elōs™ technology – a combination of heat, light, suction and massage - that is specifically designed to improve skin texture, reduce the appearance of cellulite and target localized fat deposits. The non-surgical treatment of cellulite. A non-surgical approach to inch-loss and fat reduction of the abdomens, love handles and thighs. Sculpting of sensitive areas such as the neck, upper arms and inner thighs. How does VelaShape 3 treatment work? VelaShape 3 treatment uses proprietary Syneron elōs technology to precisely target and heat fatty tissues within the treatment area to reduce circumference in problem areas and reveal a smoother shape. What does VelaShape 3 treatment feel like? Most people say that the treatment is pleasant and comfortable, comparable to a deep tissue massage. After treatment, you can resume normal activities immediately. When can I see results from VelaShape 3 treatment? You can expect to see a gradual improvement of the treated area with each VelaShape 3 treatment. Results in circumference and cellulite reduction will be most apparent six to eight weeks after your final treatment session. To maintain your results, it is recommended that you have additional VelaShape 3 treatments periodically. Like all non-surgical or surgical techniques, results will last longer if you follow a balanced diet and exercise regularly. For reading about how VelaShape 3 non-surgical cellulite and fat reduction for post baby body, please click here. Click here to read more about VelaShape 3 and here for answers to more Frequently Asked Questions.